Welcome to the Library page of Marine Histroical Society. American Woman's League (AWL) organized and was known as the Jeffress Chapter. In the early 1900s, A. W. Jeffress, a local gentlemen and farmer, was the sponsor of the Jeffress Chapter of the American Woman's League. The American Woman's League was founded by Edward Gardner (E.G.) Lewis, an entrepreneur and politically progressive activist, town planner, and Arts & Crafts potter. His publication business in St. Louis, MO, specialized in women's magazines. Mr. Lewis was the founder and first mayor of University City, MO. The founders of the Jeffress Chapter of the AWL acquired land for its future home. William and Minnie Kreutzberg sold Lot 9 to the Jeffress Chapter of the American Woman's League for $125.00 on October 29, 1909. Having enough members, the organization qualified for a Class I Chapter House to be built on the ground that was formerly the Presbyterian Church. In 1910 construction on the Chapter House began and was completed by June 1911. The Marine Chapter House was one of 38 built during the early 1900s. Chapter Houses featured the League emblem, a wreath of acanthus leaves surrounding the letters AWL, and the name, on the front, so the building would be easily recognized by members visiting from other towns. The architecture of the Chapter Houses was Prairie School and Mission style; the furniture was Mission style. Some of the original pieces are still in the library. Other furnishings included a kiln for pottery and ceramics as well as a phonograph player and phonograph records that circulated among the Chapters. The Chapter Houses were designed by Helfensteller, Hirsch, and Watson, an architectural firm from St. Louis, MO. Bas Relief above the fireplaces known as Woman's Mission by sculptor, George Julian Zolnay. The theme of the sculpture is educating, guiding, and protecting childhood, which defines a woman's highest function. The American Woman's League existed until around World War I. There was no dissolution of the AWL in Marine--it just quit existing. AMERICAN WOMAN'S LEAGUE CHAPTER HOUSE The American Woman's League was a pro-suffrage cultural organization for women. The AWL further served as an intellectual and artistic woman's club. Dues were $52 (cash) or $52 in magazine subscriptions--he organization sold magazines for Lewis Publications. The Chapter Houses offered a place for the AWL members to meet, a salesroom for the AWL's handicrafts, ceramics, and publications. Additionally the AWL offered social, educational, economic benefits and financial security. The Chapter Houses were intended to be intellectual and artistic centers of a town or neighborhood. Through the league, women were offered correspondence courses through the People's University. E. G. Lewis hoped that women would enter the business community. MOTTO of the AWL was keep your face to the sunshine and you cannot see the shadows. COLORS were purple and white. Founding members were A. W. Jeffress, honorary member and sponsor, Miss Caroline Diebert, Mrs. L. A. Richardson, Miss Maria Keller, Mrs. L. C. Heim, Miss Mary Rawlings, Mrs. J. R. Farthing, Mrs. Millard Brooks, Mrs. William Pence, Mrs. Earl Shepard, Miss Fern Shepard, Miss Verona Weber, Miss Kate Parker, Miss Katherine Henties, Miss Mary Zimmerman, and Miss Katie Deibert. The officers of the Jeffress Chapter were: President, Mrs. J. R. Farthing; First Vice President, Miss Maria Keller; Second Vice President, Mrs. E. Shepherd; Treasurer, Mrs. Mary E. Richardson; and Secretary, Miss Marie Zimmerman. The Chapter reported 29 members. The Chapter House served as a place for young people's gathering and parties. Band Boosters met at the Chapter House. The WPA began sponsoring nationwide library demonstration projects. These projects were designed to encourage development of library services in underserved populations, mostly rural area, which simultaneously providing temporary work for the unemployed. The WPA library project funds were used for new books (479 were acquired in Marine), a librarian's salary and payment of utilities and maintenance. In 1943 the project ended, and local organizations and groups continued operating the library. Mrs. Floy Neudecker was the first librarian. In 1938 Charles W. Gravius a former resident died; his sister Emilia donated money to establish the Chapter House as a library for the Village of Marine. Articles of Incorporation. 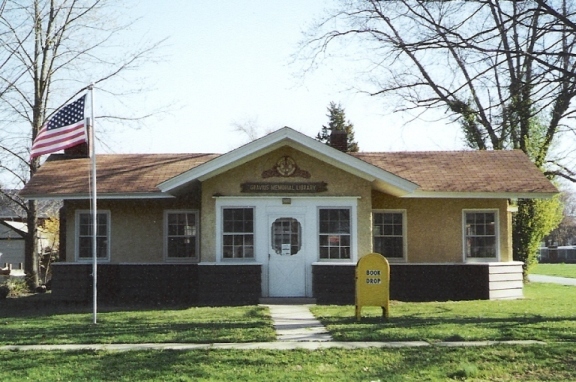 The object for which it is formed is to establish, operate, and maintain a library for the Village of Marine, Illinois, and surrounding territory and to perpetuate the memory of the late Charles Gravius who was a native of Marine, Illinois. Original directors were Walter Eheim, Ms. Emilie (Emilia) Gravius, Arthur A. Maina. There were three directors and three officers. Officers were President Arthur A. Maina; Vice President Anna E. Trahin; Secretary Ms. Emilie Gravius; and Treasurer Walter Eheim. When Ms. Emilie Gravius was named Honorary President, Mrs. Alice O. Peerk replaced the late Ms. Gravius as secretary. President Arthur A. Maina; Secretary Ms. Emilie Gravius; and Treasurer Walter Eheim. Mrs. Alice O. Peerk replaced the late Ms. Gravius as secretary. Marine Library Association was formed. From 1943 until 1957, the association received an annual stipend of $200 to $250 from the Corporation for operational expenses. The association received an additional $2500 from Ms. Gravius. Mr. Eheim suggested that a toilet be installed, but the library Association President, Mrs. Charles Ford said, that matters were too uncertain at the present. . .
During the 1940s the library was used for band lessons for the Marine School band. On the advice of the Illinois State Library Association, a formal association of 25 members was formed. New fluorescent lights were added. Library Association received a letter from the WPA stating that the library would be able to keep the 479 WPA books as long as the library was in operation. Renovations to the Chapter House included a new chimney; doors removed; cabinet taken out of hall, the main library area.. Wooden magazine rack was purchased. Girl Scouts sold library tags for the association. The association joined the Literary Guild and remained members until 1957. Mrs. Harold Gericke was named librarian. She was replaced by Mrs. Lenore Stone who served as librarian until 1955. Balance of the endowment from Miss Gravius was $1400. Mrs. Berta Bernard replaced Mrs. Stone as Librarian. Mrs. Bernard moved to Memphis, TN in 1959. Miss Esther Brandes assumed the duties of librarian until 1977. The directors of the corporation relinquished control of the Library property and the balance of the library fund. Dorothy Wentz was nominated by Mr. Eheim as a director and then resigned as a director/treasurer. Mr. Maina nominated Dorothy Wentz as president; whereupon he submitted his resignation as he felt that the people of Marine should serve instead of people residing in Chicago. Mrs. Wentz recommended that George Pence of Marine serve as treasurer. Mrs. Peerk continued as secretary of the board. A library fund was started with $1,000. The 4-H girls sold library Tags. An oil heating stove was purchased. Assets included a Time Certificate valued at $700. Members saved box tops from General Mills products for books. A check of $5.02 the bank balance from the American Woman's League was received. The association received a $5 donation from Paul Simon, editor of the Troy Times. Current value of the Time Certificate was 747.45. New roof was put on the building. A special meeting was held with Tracy [entry in the minutes does not identify Tracy] about the future of the library and about receiving support from the Village by appropriation. The library board received $2000 from the Hilda Kolb estate. Invested as follows: $1000 Time Certificate; $1000 in checking account). Title of the property for Lot 9 in Block 10 of the Original Town of Marine was vested to the Charles Gravius Memorial Library Board, Inc., from Arthur Goetz, one of the heirs of the original founders. Termite inspection was performed by Westner Pest Control. New roof was put on by volunteers with shingles donated from Lions Club and Marine Firemen. A new Corporation was formed. Directors included Richard Boyce, Bud Sides, and John Bryant. Marine Gravius Memorial Library Association merged with the corporation known as the Marine Gravius Memorial Library Corporation. Directors were Richard Boyce, Bud Sides, and John Bryant Officers were President Dorothy Wentz, Secretary Dolly Redford, and Treasurer Genevieve Sides. Ella Henze bequeathed $35,000 to the Charles Gravius Memorial Library. Library closed for remodeling at a cost of $9,000. The walls were paneled and carpeting was installed; indoor plumbing with hot water and a half bath were installed for the first time. The building was insulated, the exterior painted, new draperies hung, and new books were purchased. When the library re-opened Pat Doyle served as librarian for one month. Then Donna Holshouser Carpenter became the librarian and Jan Bryant the assistant librarian. New board included President John Bryant, Vice-President Bud Sides, Secretary Richard Boyce, and Treasurer Genevieve (Gene) Sides. Investments totaled $33,000 which included $20,000 CD, $10,000 CD, $ 3,000 CD. The building was added to the National Register of Historical Places. The Corporation received $600 as part of revenue sharing from the Village of Marine for payment of Lewis and Clark Library services. The Corporation received $650 services as part of revenue sharing from the Village of Marine for payment of Lewis and Clark Library. Lewis and Clark Library services cost $700. The Village of Marine donated $650 for this service. Exterior of the building was painted. Summer Reading program was held. Because of rising costs, the library board discontinued Lewis and Clark Library services. Summer Reading Program and Story Hour were offered. A hundred shares of Mattel Common Stock were donated by Mr. and Mrs. Tabor. Resolution was passed that no library fees would be charged. Summer Reading Program was offered. Repairs were made to the floor. Terry Robertson replaced Bud Sides as a director of the board. A new roof was installed. Christina Tina Bryant Schanuel replaced Genevieve Sides as treasurer. Treasurer Tina Bryant Schanuel resigned. After a scandal that rocked the community, the library was closed. 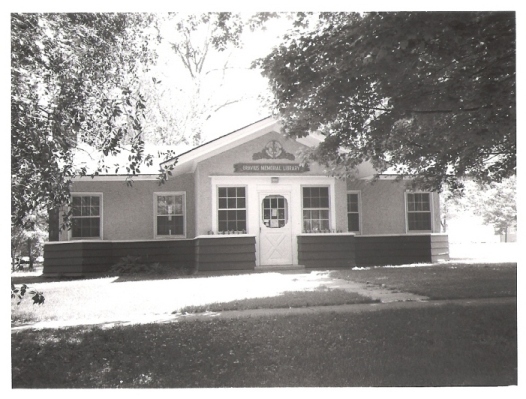 Under the direction of Terry Robertson and the help of Roberta Simmons, the library was cleaned and re-opened on September 8, 2001. Mattel shares were sold and invested in a CD for a total of $2500. Betty Criley became the librarian. She re-organized the collection and together with her husband, Ron, they organized past library records and documents. A book drop box was acquired by Betty Criley from the United States Postal Service in St. Louis. The former library board was dissolved. New board of directors was formed that included President Sandee Kershner, Vice-President Michelle Bohnenstiehl, Treasurer Terry Robertson, and Secretary Gary Wise. Book Lovers Book Club met at the library from 2003 through 2004. A flag pole was donated by the Loos family in memory of Ronald Loos, and a memorial stone was added. Betty Criley donated a library desk chair from memorials received from her deceased father's funeral. Library Sign was erected on route 143 by Illinois Department of Transportation. By-laws and constitution were rewritten and adopted so that the library board could re-apply as a non-profit entity. Roberta Simmons replaced Michelle Bohnenstiehl as Vice President. The library board began applying for grants offered by the Highland Area Community Foundation (HACF). The grants are cost-sharing grants. A grant was received from HACF. The floor was repaired by volunteers, and new carpeting was installed. The $2500 CD was cashed in to cover operating expenses. Representatives from the Missouri Historical Society and Women's Club of Calvert, TX, visited the Chapter House. Summer Reading Program was offered. The library board began having a basket stand at the Marine Homecoming which has become an annual fundraiser for the library. Tea was held at the library to encourage residents to visit the library. Board members addressed the Marine Senior Citizens Club to encourage them to visit the library. Board members addressed the Marine Lions Club seeking support to continue operating the library. Grant received from HACF and a donation from Marine Lions allowed the windows to be repaired and two new storm windows purchased which were installed by Dave Kries, a volunteer. Sylvia Morton replaced Betty Criley as librarian. Thelma Vernatti replaced Gary Wise as secretary of the board. Marine Lion's Club donated the proceeds of their pancake-sausage breakfast to the library. Marine Lion's Club and the library board began to co-sponsor the pancake-sausage breakfasts held in the spring and fall. Summer Reading Program was held. Support for the program was received from HACF. After Sylvia Morton moved from Marine, the duties of the librarian were assumed by a group of volunteers. Vice-President Roberta Simmons coordinates the scheduling of the volunteers. Volunteers include Roberta Simmons, Terry Robertson, Darlene Nicholas, Sandee Kershner, Michelle Kries, Shirley Harmon, and Thelma Vernatti. Girl Scouts planted flowers in the window boxes and around the flag pole. A new electric service line was installed. The local waste hauler damaged the service line as they were removing a dumpster after the annual homecoming. Summer Reading Program held. Support was received from HACF. New energy efficient heating and air conditioning units were installed. A patron installed the new heating and air conditioning units which were paid for with grants from HACF and the Rikli Foundation. Simmons Family donated a memorial bench in memory of Howard L. Simmons. Dusk-to-dawn light was installed on front of the building to light the flag, and the lighting in the building was upgraded to more efficient fixtures, thus reducing utility costs. The cost of the materials was paid for from a donation from one of the members of the library board as well as a memorial donation received from the Howard L. Simmons family. The work was done by John Molitor who volunteered his services. New storm windows and an insulated door were installed to further reduce the energy costs. A grant from HACF helped to defer the costs. Book signing was held for local author Gina Marie Long. Her first book was entitled Unknown Touch. Moles had done extensive damage to the yard. The yard was rolled and reseeded. This project was made possible from a donation from Marine Saw and Mower. Discontinued children's books and reference books were donated to the Highland Rotary Club for an Appalachian school library. Gary Bardelmeier repainted the Drop Box. Brown boards on the library's exterior were repainted. Harold Blumberg tuck-pointed the chimneys. Gary Wise and John Deppe requested to be removed from the library board. Book signing was held for local author Charles Schwend. His first novel is entitled Dragon Dreams. By-laws were reviewed and amended. No summer reading program was held because of lack of interest. Two antique chairs were repaired and the seats recovered with leather. Book signing was held for local author Gina Marie Long. Her second novel is entitled Unknown Scent. Library participated in the Triad High School Senior Work Days. Four students received community service credits for cleaning and re-organizing the library's collection. June 2011 marks the 100th Anniversary of the Chapter House. Jim and Linda Baer donated a banner to commemorate the 100th Anniversary of the Chapter House. The Marine Homecoming Association of the Marine Lion's Club dedicated the 2011 Homecoming to the anniversary of this building. Repairs to the building's exterior-bottom board was covered and repainted. Soffit was painted. Some landscaping was done. A grant from HACF helped to defer the costs. Betty Criley made and donated a queen-size quilt, English Garden, to be given away at the Open House in celebration of the 100th Anniversary of the Chapter House. The board agreed that money raised from the sale of tickets would be used for operational expenses. The Library Association ran and managed the library from 1943 to 1978. They purchased books, received book donations from individuals, conducted story hours, and recognized young readers for reading. In order to maintain the library, members had fund raisers and received donations from patrons, business people, and civic organizations. Each group of dedicated volunteers continued the mission of keeping the building as a library for the people of Marine. Today the library board still continues to raise monies to keep the building in good repair; to maintain current reading selections; and fulfill the intentions of the original founders of this establishment. Fund raisers include joint Pancake-Sausage Breakfasts with the Lions Club, donation jars, book sales, and the homecoming basket stand. Other sources of funding include HACF grants, donations from local businesses, civic organizations, and many loyal supporters. Since 2001, these fund raising activities have proven very successful, thus, resulting in an improved financial picture. To date the library does not receive any tax money. Today only two Chapter Houses are libraries-the Charles Gravius Memorial Library and a Chapter House located in Calvert, TX, which is maintained by a woman's club. Only 16 Chapter Houses remain. The Chapter Houses have been converted into homes or businesses. In some communities, these structures are being restored by preservationists. Members: Roy Anderson, Paula Corradi, Betty Criley, Michelle Kries, Dr. Richard Millet. Friends of the Library: Darlene Nicholas, Shirley Harmon, Janey Hamilton, Patti Brown, and Van Jarden, who faithfully mows the library grounds. DISCLAIMER: Every attempt was made to present factually a historical review of the Chapter House and the organizations it served. Many times records indicated conflicting dates and facts. Information was compiled from old library records and legal documents, information obtained from the University City Library, University, MO., various newspaper articles, and a slide lecture by Anne Woodhouse, Curator, Missouri Historical Society, St. Louis, MO, entitled American Pottery, Bungalows, and Atascadero: E. G. Lewis and the American Woman's League., January 11, 2005.